The Kamado grill lid is spring-assisted and has a latch to keep it closed. Kamado Joe is the most innovative kamado on the market. Entering a highly competitive market as recently as 2009, they knew they had to be different to be successful. Divide & Conquer Cooking System - This system is designed to let you cook as many ways as possible with ease. The Divide & Conquer Cooking System features a flexible cooking rack, halved cooking grates, halved heat deflectors, and an accessory rack. Mix and match to effortlessly change your cooking environment. Air Lift Hinge - Since ceramic is more fragile by nature, this hinge helps to decrease the chance of cracking. It reduces the dome weight, preventing the kamado lid from slamming shut and breaking. Slide-Out Ash Drawer - During a cook, the ash will collect in the ash drawer. When you’re finished cooking, all you have to do is slide the drawer out, remove the pan, and dump the ash. Wire Mesh Gasket - This is the best gasket you can get for a kamado because it offers an air-tight seal. It’s much easier to replace than other gaskets on the market, too! Cast Aluminum Kontrol Tower Top - Not only is aluminum rust proof, but this cap can be adjusted to multiple positions to allow airflow & adjust the temperature on the inside. It also prevents rain from entering the grill when not in use. Joe Jr - This is the smallest Kamado offered by Primo. This grill has convenient handles that allow you to take it on the go from tailgates to campsites. 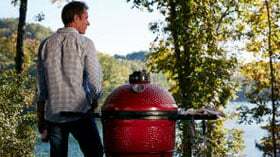 You can have a kamado experience anywhere! Kamado Joe Classic II - This grill takes all the great features of the original Classic, and has new additions like the easy close lid and latch. These added features extend the life of the grill by preventing the ceramic from breaking or cracking. Big Joe - Do you often find yourself cooking for large parties? The Big Joe would be perfect for you. While you can cook any food in a Kamado Joe Classic II, you only have enough room for everyday use. The Big Joe was made with feeding large groups of people in mind!